In the list of things I really don't like: hair frizz. If I don't style my hair properly, I'm without a doubt the queen of the frizz. And although it sounds exciting to be a queen, I'd rather pass for that title.. In come an array of products that join me in the big Battle Of The Frizz: it starts with never skipping conditioner and the promise not to let my hair air dry and continues with always using appropriate styling products that'll keep your 'do manageable. 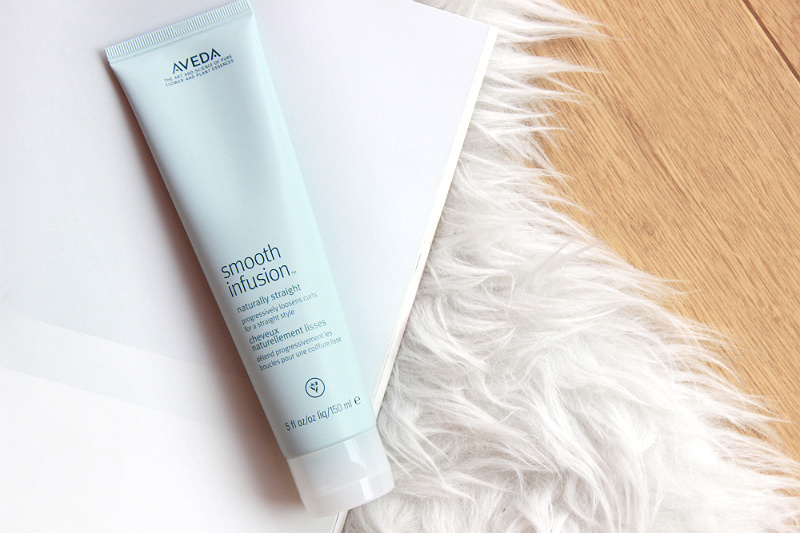 I've teamed up with Aveda to try out their latest anti-frizz drop: the Smooth Infusion nourishing styling creme. It'll nourish your tresses, control that crazy frizz and keep your hair smooth all day through. I love Aveda & I love frizz-free hair styles, so we're holding a little giveaway. Read on for a chance to win one of five bottles.. Formulated with organic cupuaçu butter and organic shea butter, this styling creme creates a lightweight barrier around each hair strand to condition and smooth the cuticle. This will lock the moisture in your hair, but will also lock out external moisture which could cause your style to fade or your hair to frizz up again. The creme also smells wonderfully with a blend of fresh citrus, Turkish rose, bergamot and Australian sandalwood. This creme really does what it promises: it keeps my hair smooth all day through, even when it's humid outside! And if you've ever witnessed your hair style melt away in about ten minutes because you've stepped outside while it's raining.. you know how important that is. It does take a while to find the right amount of product to use - I used too much the first time which made it a little greasy, so don't go overboard and start with a small amount of product. I use the creme all over my hair as using it only on the ends of your hair won't help any of the frizz happening around your roots, but small warning: doing this does make your hair turn greasy a little quicker. I find that when using this creme my hair really needs a good wash on the evening of the second day rocking my smooth style. A little trick to try when you want to keep your frizz free hair style looking fresh for a full second day is to apply dry shampoo to the roots right before going to bed. This always helps me! Send me an email on isabelle@minnebelle.com with 'Aveda' in the subject line to participate. You get an extra chance if you share this giveaway on Facebook, Instagram and Twitter. Please send me a link to your share(s) - your profile has to be public in order for me to verify this. Read the giveaway disclaimer here. This givaway is open to all residents of Belgium and The Netherlands. I'll pick five winners next Monday August 17th and will contact all five winners directly by email for your address. If you're underage, please ask a parent if you can join.